The Detroit Lions better be ready from the get-go for the 2013 season. After they open at home on Sept. 8 against the Minnesota Vikings, the Lions will play four of their next five on the road — at Arizona on Sept. 15, at Washington on Sept. 22, at Green Bay on Oct. 6 and at Cleveland on Oct. 13. Of course only the Packers and Redskins were playoff teams in 2012. If the Lions want to return to the playoffs, a good start will be crucial. Coming off a 4-12 season and eight straight losses, a solid start will be the goal. The return of coach Jim Schwartz and the offensive and defensive coordinators should be a benefit early on. To balance out the tough start to the season, the Lions close with four of their last six games at Ford Field. The NFL schedule was released Thursday night. After Detroit played four prime-time games in 2012 when they were coming off 10-6 season, they are down to just one this year. However, it’s a doozy — a Monday night game at Ford Field against the Super Bowl champion Baltimore Ravens on Dec. 16. The Lions last hosted a Monday night game on Oct. 10, 2011, when they defeated Chicago to start the season 5-0. Last year Detroit was on the road on Monday night in a loss at Chicago. Once again the Lions will host the Packers on Thanksgiving. We should have figured this one out. The division rivals have met on Thanksgiving in 2001, 2003, 2007, 2009, 2011 and 2013. 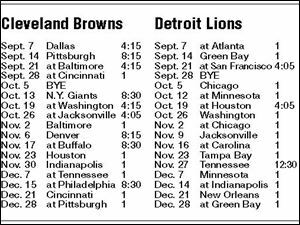 The Lions also catch a break with their bye week smack in the middle of the schedule on Nov. 3. Sept. 8 — Minnesota, 1 p.m.
Sept. 15 — at Arizona, 4 p.m.
Sept. 22 — at Washington, 1 p.m.
Sept. 29 — Chicago, 1 p.m.
Oct. 6 — at Green Bay, 1 p.m.
Oct. 13 — at Cleveland, 1 p.m.
Oct. 20 — Cincinnati, 1 p.m.
Oct. 27 — Dallas, 1 p.m.
Nov. 10 — at Chicago, 1 p.m.
Nov. 17 — at Pittsburgh, 1 p.m.
Nov. 24 — Tampa Bay, 1 p.m.
Nov. 28 (Thanksgiving) — Green Bay, 12:30 p.m.
Dec. 8 — at Philadelphia, 1 p.m.
Dec. 16 (Monday) — Baltimore, 8:40 p.m.
Dec. 22 — N.Y. Giants, 4 p.m.
Dec. 29 — at Minnesota, 1 p.m.